It's all about music and pleasure in 18th-century Venice!. 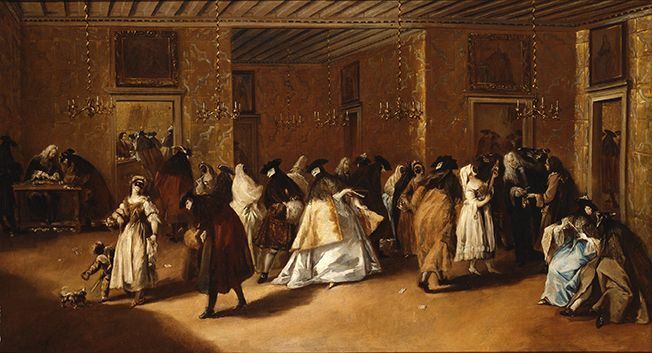 Though music was always present throughout Venice, it made itself particularly heard during the carnival period. A unique time in the Doge's Palace since this lasted from the month of October to Advent, then from 26 December to Shrove Tuesday, and two additional weeks during the Ascension. Venetian opera houses abounded, notably the Teatro San Benedetto (the most famous of the second half of the 18th century), the Teatro San Moisé, the Teatro Sant’Angelo (of which Vivaldi was the impresario), and the Teatro San Samuele, where Vivaldi's Griselda was first performed. Farinelli experienced a great success in Venice, to the point of being followed through the Piazza San Marco whenever he went out. Since Farinelli brought in the largest audience, there was often a frantic imitation between the theatres, staging increasingly magnificent performances, in order to bring in an equally large audience. This same aristocracy would then, having returned to their native country, wish to rediscover the same charms of their recent Venetian voyage. The great singer Faustina Bordoni, born and musically trained in Venice, garnered such a great success that her career led her far beyond the Italian borders, to London where she premiered countless operatic roles by Handel, and to Dresden where she eventually married the composer Johann Adolf Hasse. One particular feature of Venetian musical life in the 18th century was the presence of renowned artists and composers employed as musical directors by the four famous Venetian hospices. The most famous of these hospices, the Ospedale della Pietá, boasted Vivaldi as their first violin teacher (from 1704), and then principal composer (from 1713 to 1740). Every Sunday at the church of each of the four ‘scuole’, during vespers, motettos or anthems with full choruses, accompanied by a great orchestra, and composed and directed by the best masters in Italy, are sung in the galleries by girls only; not one of whom is more than twenty years of age. I have not an idea of anything so voluptuous and affecting as this music; the richness of the art, the exquisite taste of the vocal part, the excellence of the voices, the justness of the execution, everything in these delightful concerts concurs to produce an impression which certainly is not the mode, but from which I am of opinion no heart is secure.